Brandy Rayana Norwood was born on 11th of February in the year 1976 in McComb, Mississippi of U.S. She forayed into the music career only when she was 15 by releasing her first music album. Brandy Norwood is also a famous name in the genre of films and modelling industry. Multitudinous awards received by her have proved her fame throughout the globe. Brandy is known for her tattoos also for which she obtains a great fascination. She likes to live in a trendy way that is implied by the designs of those tattoos. However, alongside being highly modern, she possesses a deep trust on the spiritual matters which has led her to make a Lord Ganesha tattoo on her left arm maybe to keep hassles far away from her. 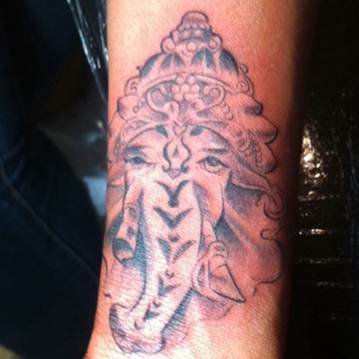 This tattoo is denoting the face of Lord Ganesha posing wondrous artistry. She has been carrying this on her arm since 2010. This famed and versatile lady has another tattoo on her back. 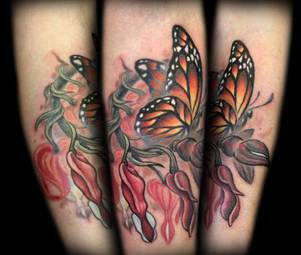 That is a butterfly tattoo which undoubtedly bears the insignia of beauty on that beautiful figure. It’s considered as the symbol of Reincarnation through which the path towards heaven gets revealed. Apart from all these, Brandy has a tattoo that is devoted to her passion music that also explores her passion for tattoos.